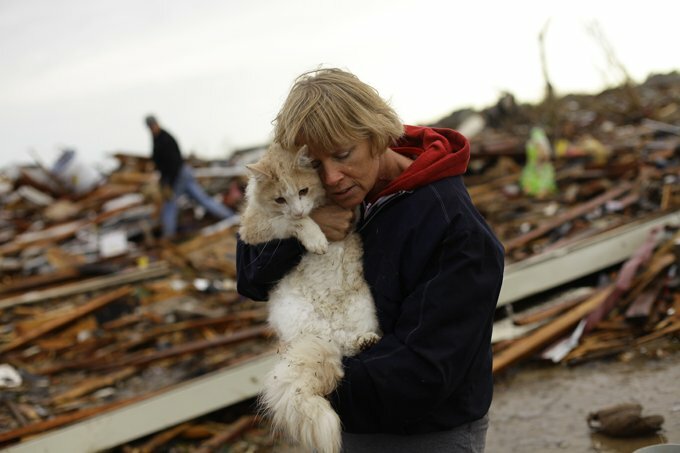 With recent hurricanes, severe snow and rain storms, and tornadoes, what can I do to prepare my pet for such an event? It’s great that you are thinking ahead on how to protect your pet if disaster strikes. Over 97 percent of pet owners say they would take their pets with them if they were forced to evacuate due to an emergency, but only 25 percent have the necessary pet care items on the ready at a moments’ notice. Planning ahead is key to keeping your critters safe. Microchips are an essential form of permanent identification, which along with an id collar provide the best reassurance your pet with be reunited with you if lost. Pet carriers are vital for pet housing and transport during emergencies. Ensure you have one pet carrier for each pet in the home. Assemble a pet care kit that meets your pet’s needs for three weeks. Include food, bowls, bottled water, leashes, toys, a first aid kit, medications and sanitation items like litter, poop bags and hand sanitizer. Assemble those items in a bucket or bag for easy portability, and vow to not use the supplies for daily pet care needs. Inside that kit also include a picture of you with your pet, medical records and emergency contact numbers for family, veterinarian, boarding facilities and pet friendly hotels. Be sure to check expiration dates on supplies and replenish your kit every six months.